These is a difference between feelings and emotions. Feelings give us information and energy about what is going on right now and disappear if we use them in accordance. They don't last longer than three minutes and emerge appropriate for the current situation one time only. Regarding the three kinds of emotions we are here mainly interested in the ones originating from the childhood, that means uncompleted feelings in the past. They can be triggered by certain “buttons” (over and over) again and are key for healing processes. In a such a situation we often made decisions that guaranteed our survival at that time, however are no longer appropriate for our present self. A healing process follows the trail of old emotions and utilizes this key in such a way that the client can re-live the situation once again and this time fully express all arising feelings. 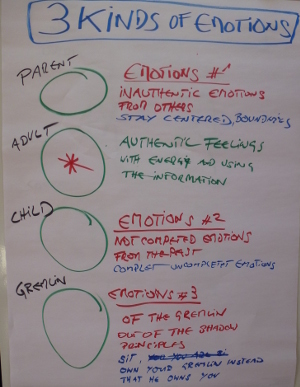 Prerequisite therefor is the experience with feelings work as it is facilitated in the Expand the Box Training. Then it is possible to discover the old decisions and experience how they still have an effect today and take new decisions with adult responsibility that are appropriate for the adult-self and provide more possibilities.